The GRACE Ministries food, clothing, and diaper distribution is this Saturday, the second Saturday of this month and every month at Sterling UMC. But this week the volunteers have been hard at work since Thursday evening; shopping for food; moving the product from storage to point of distribution; setting up the freezers; and preparing to receive the delivery from the Capital Food Bank that will supplement the donations of food, clothing, and diapers already stored on site. Friday morning the truck from the Capital Area Food Bank arrives early. The 9:00 AM “afternoon” delivery often catches the helpers by surprise, but the work always gets done. 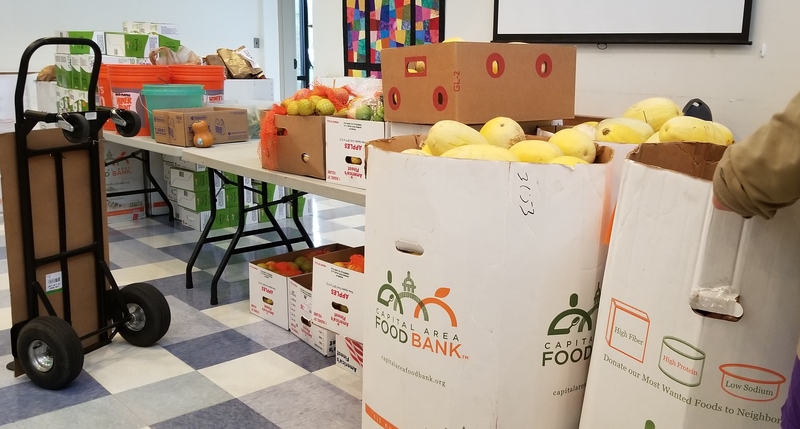 The caravan of hand trucks moves the five or six pallets of fresh produce, and non-perishables into the fellowship hall where the event is set up. Later in the day the food items are sorted, bagged, and staged; the clothing racks assembled and the clothing put on hangers; the diapers from the NOVA Diaper Bank sorted by size as more volunteer helpers trickle in and the distribution line takes shape for next morning’s guests. Though the doors open at 7:00 AM, the distribution occurs between 8:00 AM and 10:00 AM. Those still in line at 10:00 AM aren’t turned away. The process is very organized with check in and passes required that allow the participant access to clothing, food, and diapers. Each family representative is assisted by a volunteer with a cart and boxes and together they move through the lines past the tables of canned goods, rice and pasta, fresh produce, juice, frozen foods, and diapers. Once through the line, the volunteer will assist in making sure the groceries and other items are placed safely in vehicles before helping the next person in line. Once the 10:00 AM hour has passed and the last few families make their way through, the clean up and take down begins. Inventories are taken and documented; clothing racks stripped of their contents and placed back in the boxes that will be stored until the next month; the food items are secured in safe storage ready to be rolled out the next month. By 12:00 PM everything is put away, and there is no sign of the mission effort that just helped feed and clothe 80 to 100 families made up of 450 to 500 local community members in need. The 30 to 40 volunteers required to make this happen can now go home to their own families but by no means are they going home empty. They have been “fed” as well, their hearts are full. From the GRACE Ministries website: GRACE Ministries of the United Methodist Church is a community outreach program serving low income families living in Northern Virginia…established to address the most pressing material and spiritual needs of low-income immigrants in the region and to empower immigrants to become community leaders. GRACE Ministries provides emergency food, clothing, household items, diapers and healthcare information and screenings at seven United Methodist Churches in Northern Virginia. GRACE Ministries also provides job training programs to become personal care aides and certified nurse aides. Sterling UMC is one of many churches who participate in the GRACE Ministry program. For information on SUMC’s GRACE Ministry program contact jeffrey.bradley@sprint.com. The GRACE Ministries mission effort at Sterling UMC is one of many local missions that benefit our Sterling community and its neighbors. Sterling UMC is a community church and all are welcome to assist with our community outreach and to worship and pray with us on Sunday mornings.